First you can choose of which category you want to download a papercraft (like The Legend of Zelda, Final Fantasy, miscellaneous, etc.) by clicking the logos above or at the top of the page or in the list on the right side. In each category there are posts for each papercraft that I made, and in the posts will be the download links for the parts and instructions. 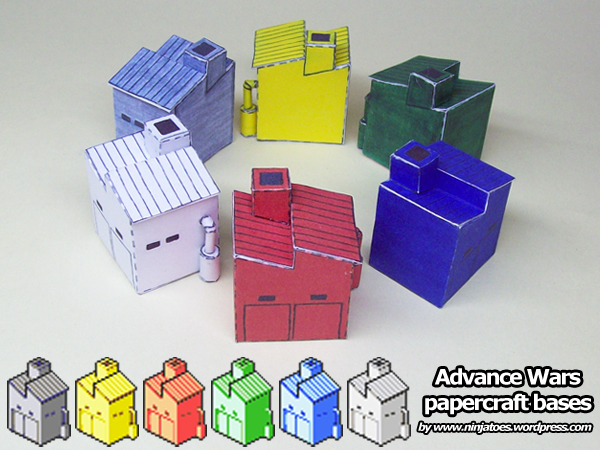 Clicking the download links will either open a PDF file with the papercraft parts to save to your computer and print, or a ZIP-file with the papercraft parts inside as a jpg image file. I hope this explains things, have fun building! Hi! I just wanted to say thank you for all these wonderful papercraft models. I discovered Pepakura through your blog and now I love it. Thanks a lot for sharing! HI! I just wanted to say that I really like your page!! …and to have people discover your own papercraft weblog with neat Cubees of Grimm, Xena, Ice Age and even Gilligan’s Island, I hope! ;o) Have fun papercrafting! I have really liked your BSG collection. I was wondering if you have plans to make the Viper MK-VII, Stealth Viper (Blackbird/”Laura”), Stealth star (the first Stealth Viper). or the Raptor any time? I think that these would be a great addition to your collection.